Some lawmakers decide not to run for re-election because they just know, for them, it is the right time to step aside. 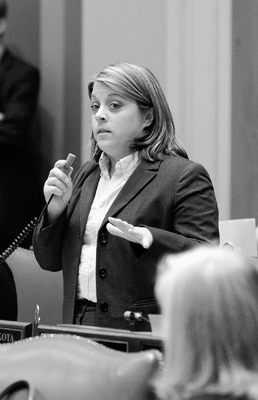 That’s the case with Rep. Karla Bigham (DFL-Cottage Grove), who announced early in session that she would not be running again. “It’s just a good time in my life to make some changes,” she said. Bigham, 31, started early in politics, winning a seat on the Cottage Grove City Council at the age of 25. Two years later she made a successful run for state representative, ultimately winning two terms. She has also chaired the Cottage Grove Public Safety, Health, and Welfare Commission. Having spent the majority of her post-college life in elected office, Bigham is proud of her service, but said she’s missed out on a few things because of it. “You put some things on hold that the average person who’s not running for office would probably have gone through,” she said. Bigham, who is leaving behind a legacy of public safety legislation, works as a paralegal in the property crimes division of the Hennepin County Attorney’s office. She plans to pursue a law degree, and is in the process of applying to several law schools. In 2009, she successfully sponsored a measure that banned sexual predators from using online services like Facebook and MySpace, and from using mobile phones and other devices to sexually solicit children. A year earlier, she was able to get legislation enacted that required background checks for coaches at K-12 schools. Bigham points to her work on protecting children from sexual predators as among her most important accomplishments. “A lot of the public safety initiatives I’ve been proud, over the last four years here, to be part of,” she said. If all goes according to plan, she will cap off her career at the House with passage of a bill that would require convicted drunken drivers to install ignition interlock devices in their vehicles that prevent them from driving while intoxicated. “That, I think, will be a major step in the right direction to keep our streets safe from drunk drivers,” she said. Bigham, who arrived with the 2006 electoral wave that restored DFLers to power in the House, said she and her colleagues have passed a lot of other important legislation, especially in the area of clean energy. “We’ve done a lot of energy and environmental policy that is nation-leading that I’m very proud of,” she said. Bigham said she remains committed to her community. She has deep roots in Cottage Grove, having been born and raised there, and plans keep active in local organizations. “You don’t have to be an elected official to make a difference, and I plan on continuing to stay involved, especially at a local level,” she said. Bigham said she’ll miss the ability to respond to her constituents’ needs, whether it’s helping someone apply for MinnesotaCare or unemployment benefits, or being an advocate for local projects like the Wakota Bridge construction. Asked whether she would consider running again someday for elected office, Bigham said she is open to the possibility. Is the push to transparency clouding the session end game? Feature: Is there a page in the House? Figures and statistics on the Minnesota House of Representatives in 2009.